This is an exciting time for paleoanthropologists to be involved in evolutionary biology. New discoveries of previously unknown primates and new fossil material of poorly known taxa are constantly changing our perspectives on how our closest relatives evolved and behaved. Phylogenetic systematics is a powerful investigative tool for generating and evaluating new evolutionary hypotheses. Its power lies in its transparency and paucity of assumptions; rather than appealing to the authority of what we "already know,'' parsimony analysis generates hypotheses allowing the raw data speak for themselves. Phylogenetic systematic methodology has become widely accepted among anthropologists and paleoanthropologists in particular; most generally acknowledge its applicability to evolutionary studies of the primates (Groves 1978; Strasser and Delson 1987; Disotell 1996; Begun et al. 1997; Rae 1997; Ross et al. 1998; Harris 2000; Begun 2001; Newman et al. 2004). Many of these studies have revealed aspects of primate relationships that were previously unknown and have pointed to new avenues for research. For example, Begun's (2001; Begun et al. 1997) analyses of 14 taxa and 240 and 247 characters, respectively, suggests that Eurasian late Miocene hominoids (Dryopithecus and Ouranopithecus) are the sister taxa to the African ape-human clade. 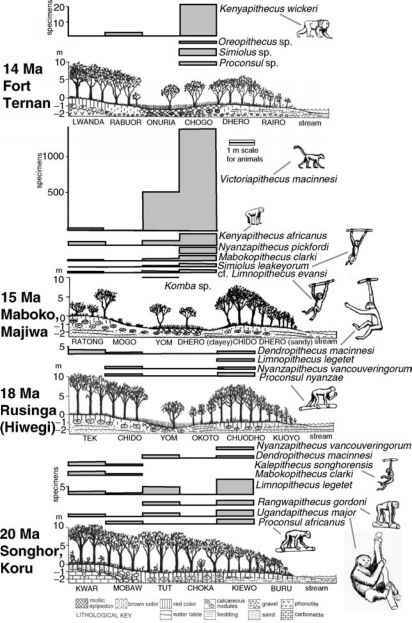 We can use this hypothesis to draw inferences about Miocene hominoid biogeography; Begun mapped the areas in which hominoids are found onto the cladogram to demonstrate that the most parsimonious optimization is of a Eurasian origin of the African ape-human clade. Likewise, it is possible to map characters onto the tree to explore how certain characters evolve. It should be clear that to avoid circularity, the tree must be robust enough to maintain its topology without the characters under investigation (Brooks and McLennan 2002). Phylogenetics is not without detractors in the anthropological community. Some have suggested that complicating factors specific to hominids may result in fallacious results using phylogenetic systematics (Andrews 1992; Lieberman 1999; Collard and Wood 2001; Hawks 2004). In a recently published article, Hawks explored the degree to which cladistic methodology is able to clarify relationships within hominids. He cited difficulty with character choice, character independence, atomizing continuous traits, and coding polymorphic characters as key causes undermining the reliability of phylogenetic methodology. These factors are not restricted to hominid systematics; they constitute some of the most important and subjective decisions in phylogenetic research. There is no real consensus on how to code morphological characters, or even what constitutes a good character. A character is merely an observed part or attribute of an organism (Colless 1985), assumed to be heritable. The nature of characters is clade-dependent, and the usefulness of any particular character in a phylogenetic analysis will be directly related to whether it is a synapomorphy or not. Of course, we do not know whether a character is synapomorphic until we run the analysis, based on as large a number of characters as possible. Concerns about character choice are based on the notion that a set of characters that have all evolved in concert, yet in parallel, as a result of convergent selection vectors, could produce a robust Hennigian result that was nevertheless an incorrect depiction of phylogeny. Collard and Wood (2001) suggested that correlated functional convergences in catarrhine face and jaws made phylogenetic analyses using only those characters unreliable. This is a problem for paleoan-thropology, in which the majority of fossil remains are exclusively, or nearly so, crania and teeth (Strait et al. 1997). It is true that for any data set in which correlated homoplasies outnumber homologies, Hennigian methods will produce an incorrect result. In the Hennigian system, however, homoplasies are not known a priori, so correlated homoplasies cannot be known a priori. Therefore, we must assume character independence alongside the presumption of homolo-gy. This has recently been dubbed Kluge's Auxiliary Principle (always presume character independence in the absence of evidence to the contrary) (Brooks and McLennan 2002). This principle asserts that the identification of potential cases of correlated homoplasies begins with a phylogenetics analysis, which identifies correlated traits. Once historically correlated traits have been identified, a researcher can ask whether or not they have unduly influenced the results. If reducing the number of phylogenetically correlated traits that come from a single part of the body significantly alters the phylogenetics hypothesis, only then is it reasonable to discuss the possibility of correlated homoplasies affecting our phylogenetics reconstructions. Similar reasoning applies to the coding of continuous (meristic) and polymorphic traits. Both pose theoretical and methodological problems for the interpretation and optimization of characters on the tree. For example, the "polymorphism'' setting in PAUP* does not allow hypothetical ancestors to possess the polymorphic condition (Swofford 1998). This is a default to maintain tree length at a minimum. PAUP* treats polymorphic taxa as heterogeneous, however some programs treat taxa possessing multiple states as missing data (Wiens 1995). Finally, we must remember that phylogenetic analysis of any kind is merely an analytical tool. If the results of a Hennigian analysis are not what we expected, there is nothing in the methodology that requires that we believe that the results of any given analysis are true. Rather, we are faced with several possibilities: (1) the data are lying to us and no amount of additional data will rectify the problem, (2) the method is flawed, or (3) we do not have enough data. If we opt for the first two possibilities, we must then choose a model that better fits our beliefs, experience, or understanding of the evolutionary process than do the data, then reconcile the data to the model. If we opt for the third possibility, we need to be exhaustive and explicit in character choice, to include new data and reevaluate our hypotheses frequently, and to use independent data to corroborate or refute those hypotheses. Phylo-geneticists must be explicit about the methods they use to generate and evaluate trees, and those evaluating their publications need to be aware and informed of the methods used. A list of character descriptions as well as the data matrix used to generate the tree should be available so that other researchers can evaluate the authors' character codes. Consistency indices, decay analyses, and consensus trees are important procedures for assessing the robustness of results, and should be published. As well, the techniques employed to generate these results should be clear. Other elements to consider when generating or evaluating phylogenetic hypotheses include: Do independent data (e.g., fossil dates, biogeography, behavior) corroborate or refute the hypothesis? Were all known taxa included? If not, is it because of ''poor preservation, or lack of adequate sample size''?